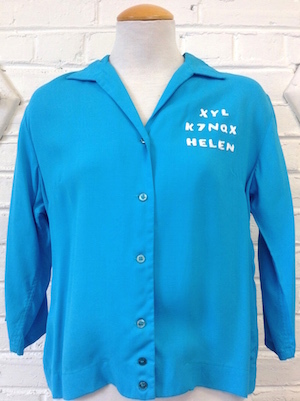 (S-M) Womens Vintage 1950's King Louie Bowling Shirt "HELEN" and ham radio call signs! 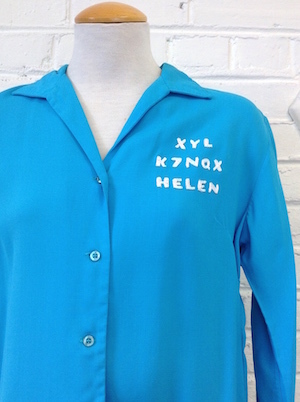 Home > Womens Vintage Clothing > (S-M) Womens Vintage 1950's King Louie Bowling Shirt "HELEN" and ham radio call signs! Womens Vintage 1950's Bowling Shirt. Gorgeous bright turquoise rayon with white embroidered lettering. 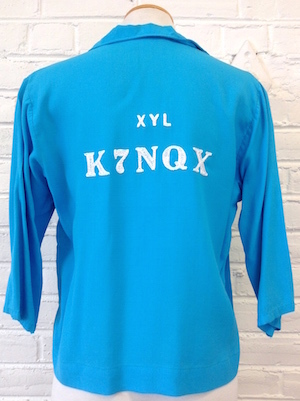 Left side reads "XYL K7NQX HELEN" and embroidered larger on the back are the same call letters. K7NQX was apparently a HamRadio Call-sign that belonged to a fella' named Glen R. Blackburn, so maybe this belonged to someone who worked at a radio station. Has 3/4 sleeves and six shiny blue-green buttons. Small 50s collar, shirt-jac style with 2 bottom buttons for a straight hem when closed. Darted chest. Tag reads "Ten Strike by King Louie, Washable" . Sleeves: 21" collar to cuff / 15" shoulder seam to cuff. These are 3/4!